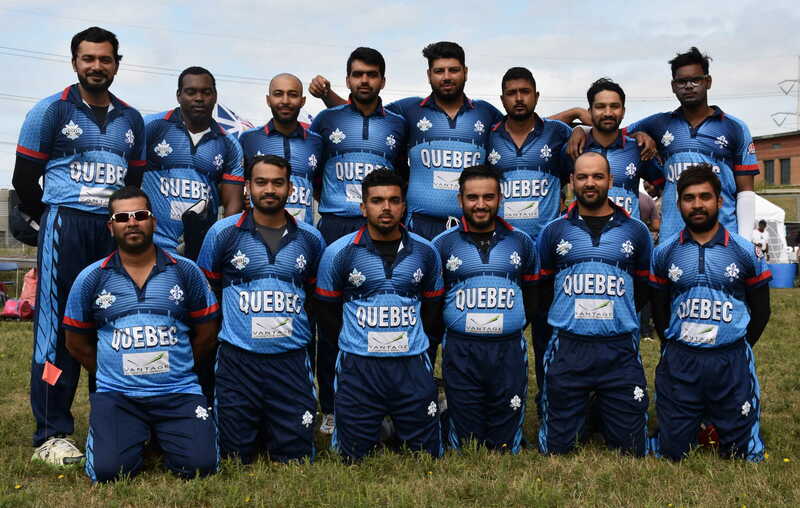 The Eastern Canadian T20 Championships were held this past weekend in Montreal, Quebec. Six teams took part, two from Quebec (Quebec Red and Blue), Nova Scotia, PEI, New Brunswick and Newfoundland and Labrador. A full round-robin was played but unfortunately the scheduled final and bronze medal matches were rained out on Sunday. Quebec Blue topped the round-robin standings with four wins and a tie, with Nova Scotia (4-1) second, Quebec Red (3-1-1) third, Newfoundland (2-3) fourth, New Brunswick (1-4) fifth, and PEI at the foot of the table (0-5). Daksh Talwar of Nova Scotia was the best bowler, taking 14 wickets with his leg-spin, 6 more than the next bowler. Pooran Ramkissoon of Quebec Red was awarded best batsman with 119 runs. Raheem Gilani of Quebec Blue was named the tournament MVP, top run scorer with 135 runs, and with 5 wickets. The tournament was played at the Aqueduct Park grounds; having two pitches side by side helped with logistics, and allowed the entry of the extra team from Quebec. The ground itself however was not really conducive to good cricket and highlights the challenges with infrastructure that plagues Canadian cricket. The ground is in a good location, not far from downtown Montreal in Verdun, and constructed over the top of an underground reservoir, part of the Montreal water supply. The advantage of this is that the area is unlikely to be developed for any other purpose- the disadvantage is that activities are severely limited due to possible contamination of the water supply – so no changing rooms, or any permanent construction. The pitches are built with an artificial plastic mat laid over crushed stone gravel. Although this can provide a good playing surface, it does require careful maintenance. The pitches unfortunately suffered from very inconsistent bounce, which made batting a real challenge at times. The outfield badly needed a mow, and was uneven, with in places large rocks at the surface providing a hazard. It is understood that, as for many cricket grounds in Canada, this is out of the organizer’s control- the municipality is responsible for mowing the field, and so on. 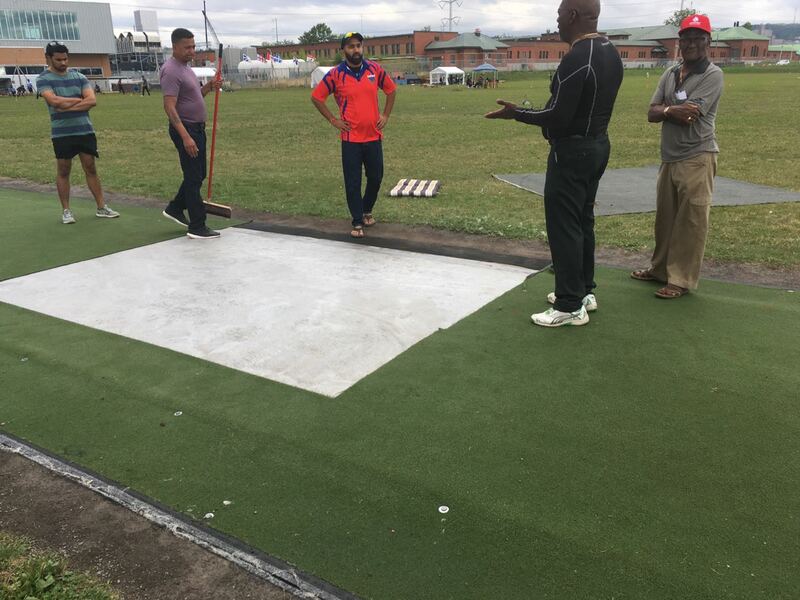 It might be worth considering looking at artificial pitch options if the stone/ mat combination is difficult to maintain – but whatever the circumstances, it is hard to develop top-level cricketers if the supporting infrastructure is of this quality. We emphasize that we mention these problems not to criticize the efforts of the hosts in any way, but to highlight the challenges facing cricket in Canada. The combination of pitches, outfield and long boundaries resulted in a low-scoring tournament – only 34 sixes were hit in the 15 matches played (compared to 160 sixes in 11 matches in Newfoundland last year). Fours were very challenging to hit with anything other than a lofted shot – well struck strokes that perhaps merited four died in the outfield for twos. The top-run scorer made 135 runs- last year 5 bats scored more than 200, with the top-scorer over 300. The successful batsmen adapted to the conditions and scored mostly with singles and twos. The conditions were of course the same for all teams, and those that adapted were successful. There were some outstanding matches- Quebec Red fell just short of a last over win against Nova Scotia in the opening match. 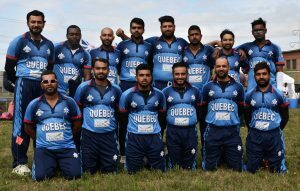 In what proved to be effectively the match for the championship, Nova Scotia made a valiant attempt at defending 96 against Quebec Blue – only a dropped catch and Nimesh Patel’s 28* at number 8 standing in their way. PEI lost every match, but were competitive in all of them, with some excellent opening bowling supported by smart batting. They were within one wicket of beating Newfoundland, and when rain stopped play against Nova Scotia, they were just 5 runs behind on Duckworth Lewis. For a province with less than 50 regular players, this was a remarkable achievement. The tournament set a high standard for coverage, with most games streamed live on CricClubs.com, and live electronic scoring – by far the best coverage from a regional T20 to date. 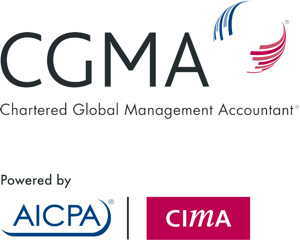 Full statistics and standings were available almost immediately. At the ground, scoreboards were clearly visible and kept up to date, often by members of the competing teams. The Quebec Cricket Federation were excellent hosts, and the visiting team well looked after. The host committee also had to face a completely unexpected challenge, when both pitches were vandalized overnight after the first day of the tournament. Large strips were cut from both, in what appeared to be a mean-spirited attempt to disrupt the tournament and embarrass the hosts. They were completely unsuccessful in this as the local volunteers dealt with the situation in a highly professional manner, and play was delayed by only an hour. The repaired pitches played as well in the previous day, and far from embarrassing the hosts, this cowardly attempt just showed the strength of the volunteers, and the spirit that keeps cricket going no matter what. Thanks to Eddie Norfolk for his photos.